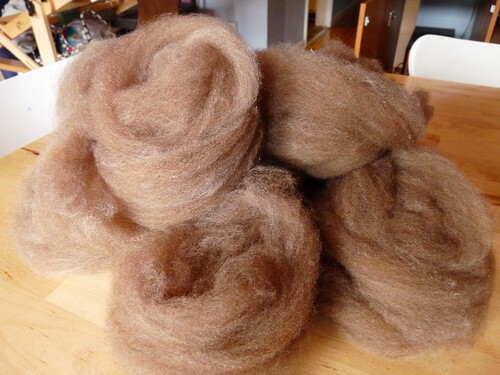 Yall who are obsessed with fiber prep like I am probably had the same reaction to the Yarn Harlot's post on loading fleece/fiber sideways onto a drumcarder-- namely, "dude, I need to try that!" Since I had sold my drumcarder I opted to try the method on my almost longlost pair of handcards instead... tools I don't usually use or reach for or admittedly even think about. ...that I rolled up and pulled into short roving lengths. 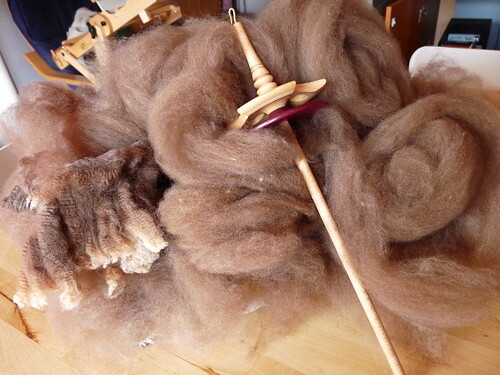 All said and done I had about 3.5 ounces of pulled rovings from rolags, which looked like a huge mountain even next to my relatively huge spindle I intended on spinning them on. I keep wanting to add more but get more nervous about dropping it as time wears on so I've stopped for now. ...that'll be eventually plied together into a bumpy textured but soft bulky yarn. I still have another bobbin at least to fill, but it'll take no time at all. I really, REALLY enjoyed blending the fibers on my handcards-- using commercially prepared fibers (as opposed to raw fleece) seemed to help me in not nepping them, and it was just effortless! 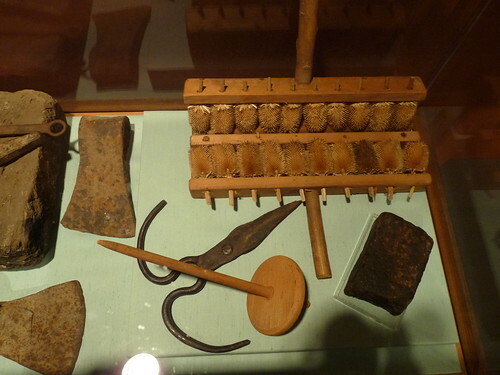 I love combing, don't get me wrong-- but I can't put my feet up and watch episodes of Firefly on hulu (new to me!) while wielding them like I did with the 'cards. Blending on combs isn't really a great proposition anyways (fibers generally need to be the same length on the combs or will pull off sooner/later than the others you're trying to blend with, making homogenity difficult)-- but I can't wait to try this again with more luxury fibers and utilitarian wools. Handcards made from thistle heads, and a big old (supported?) spindle. I think its so cool, coming so far but still being very close to the techniques of a hundred years ago. 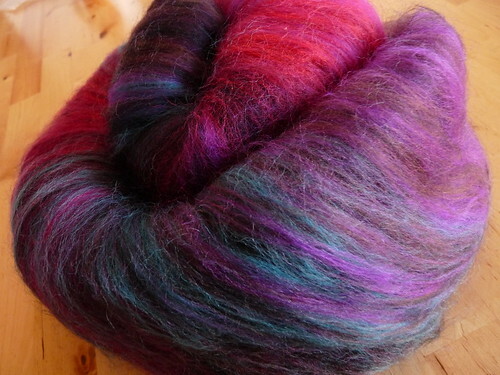 On the other, far end of the cool carding spectrum, I was gifted a membership to the Grafton Fibers "Colorways" club from my secret santa this year (!!!) and have been hoarding the stunningly beautiful color batts and petting them when I need a shot of color and love in my life. I have no idea what I'll be making with these... part of me wants to spin each batt to the same weight and end up with 12 skeins to knit into an afghan, an amazingly colorful block afghan. 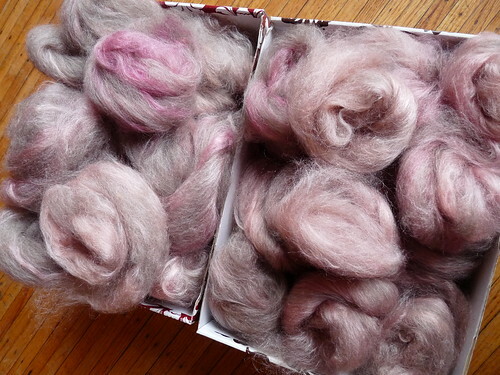 The other part just wants to hoard them; I can't believe how soft and perfect the batts are and it makes me happy that colors like this exist in the world. 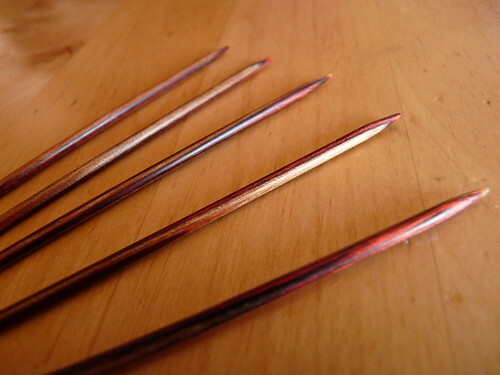 Made in the USA by hand, they are sharp and solid-- these are the 2.25mm (US 1) size and I am not afraid in the slightest for snapping or bending them. See? Damn, I was hoping you'd take my oh-so-subtle hint on Flickr. 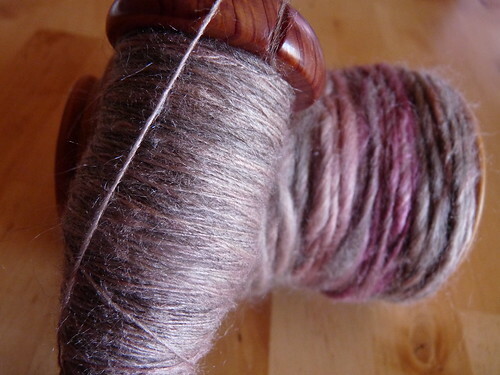 ::wink:: Lovely spinning, and Henna is turning out gorgeous! 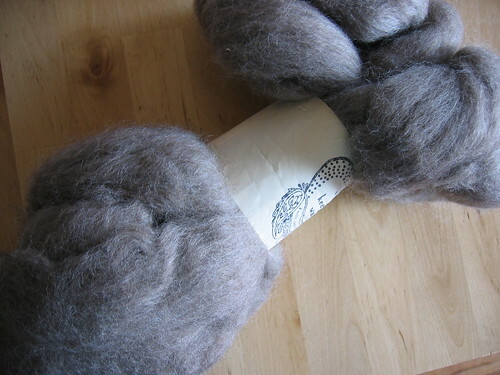 I've been spinning some of my natural fleeces in anticipation of the Wool Auction fleeces showing up in 2 weeks. Every time I pull out my pin-drafted beehives, I think of you and your happy wool combs. When are you going to be at Stitches? There's a drink there with your name on it. Hrm. I read a few pages of comments on the Harlot's sideways posts. 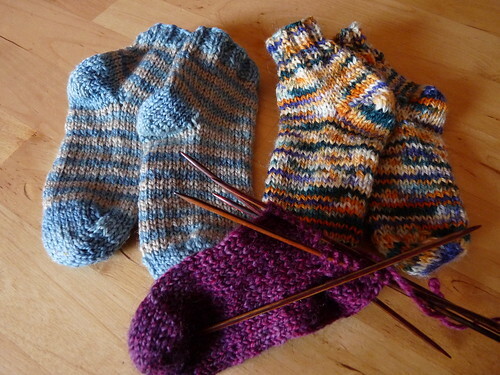 I'm not sure people are grasping the whole woolen vs worsted concept. 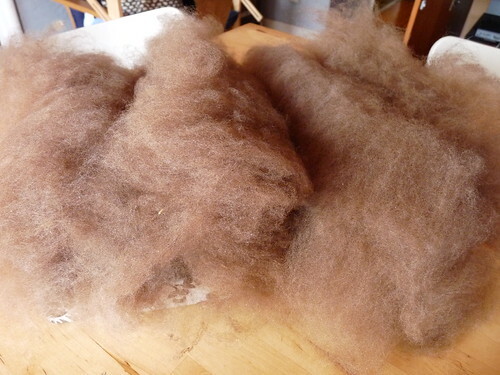 Seems folks are just drum carding commercially processed combed top and expecting hruge floofy batts out of it. Of course feeding the staple lengths in via the tray sideways is going to produce floofier batts. 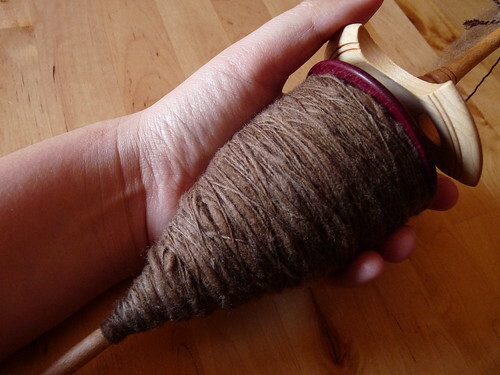 Just as spinning from the fold or from a rolag long-draw produces an airier yarn. 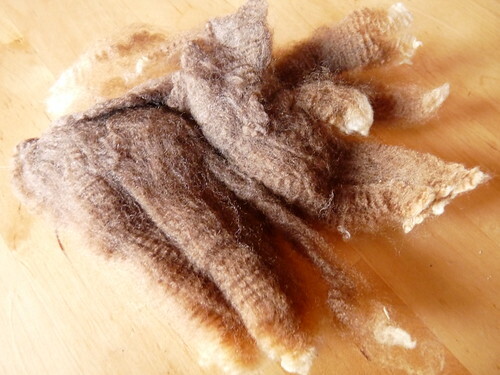 Abbybatts are more of a worsted prep than woolen, IMO, due to her using combed top and carding method. Properly picked locks are going to card up much floofier than lock-by-lock (one end in or another) on the infeed tray. As for handcards? Different beast, you're charging the carding cloth directly instead of using a licker-in drum, so the effect of feeding fiber in "sideways" isn't going to work too well, as you've discovered. And wow, I just cannot fit that much on my spindles. I normally get to about 1/2-2/3 of the spindle weight and it's just impossible. Maybe I don't make the cop nicely enough? Who knows. wow, this is some fiber pr0n. your handcarded polworth/silk bundles are so so gorgeous. and the cormo locks... oh, the cormo locks. Now I feel excited all over from all the fiber you just showed. Ooooooo Ahhhhhhh. What a great post. I've been spinning for a long time and have accumulated a large collection of fiber prep tools, but the handcards have always been my favorite. I was starting to think I was the only person in the world who likes them. They are so convenient, and I find the carding motion very soothing. Blending is fun, too. Thank you! 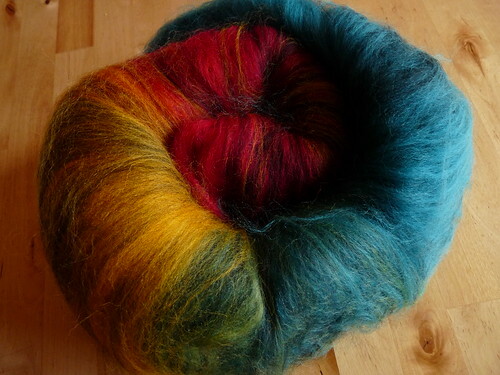 I love the polwarth/silk spinning! You're giving me ideas! 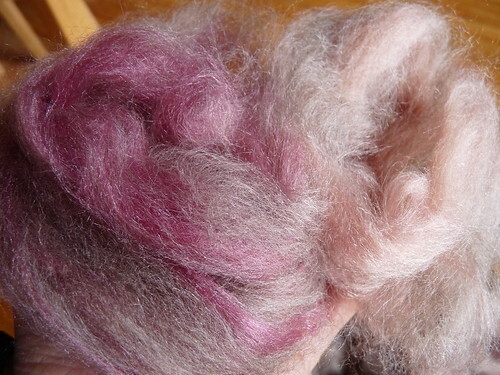 I also need more practice carding, and that blend is gorgeous! 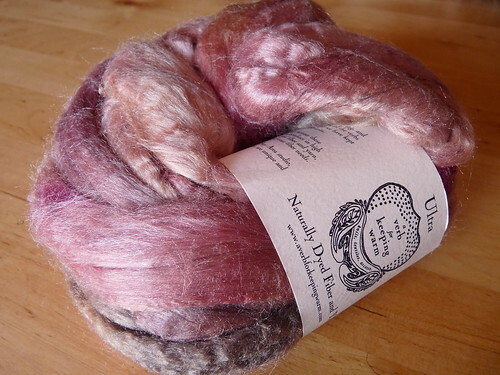 Love your blending- Should make some gorgeous yarn!